The classical cool of the Greek and Roman goddess dress has long been prized by designers who have recast the draperies of figures like the Caryatid from Hadrian’s Villa, (c. 130 CE). Madame Grès repurposed the aesthetic to perfection, as exemplified by her white silk column dress (1937), a design that is remarkably free of structure for its time. Charles James. Ball gown. 1951. Image and original data from the Brooklyn Museum. Image © The Metropolitan Museum of Art. 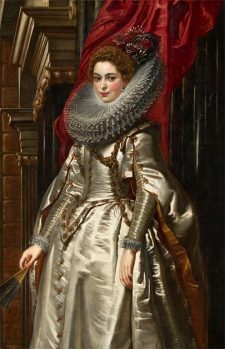 Leaving behind the elegance of antiquity, behold the exuberance of the Marchesa Brigida Spinola Doria (1606), a Genoese aristocrat depicted by Peter Paul Rubens — resplendent in voluminous shimmering cream satin, ostensibly her wedding attire as this was probably painted as a bridal portrait. 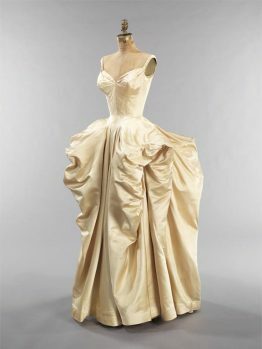 Charles James provides the less demure mid-century version of the Marchesa’s dress in his 1951 ivory satin ball gown. A veritable construction with four hipline poufs, it was worn by a Chicago debutante for her coming out. Elisabeth Louise Vigée-LeBrun. 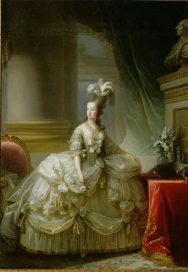 Archduchess Marie Antoinette, Queen of France. 1778. Image and original data provided by Erich Lessing Culture and Fine Arts Archives/ART RESOURCE, N.Y.
Court dress. British. c. 1750. Image © The Metropolitan Museum of Art. No slouch as a consumer of extravagant fashion, Marie Antoinette wears another extreme look in her portrait of 1778 painted by Elisabeth Louise Vigée-LeBrun. By this time the young monarch was fully in the thrall of designer Rose Bertin, dubbed the “Minister of Fashion” by the scornful French. 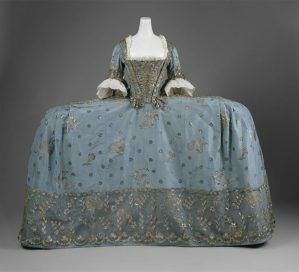 A robe à la française, c. 1750, attests to the volume of the skirt, supported by outsized panniers typically constructed of willow or whalebone. By its very design such a garment precluded work or activity. Its wearer would have to turn sideways to enter a room. House of Dior. Maria-Luisa (dite Coré). 1998. Image © The Metropolitan Museum of Art. John Singer Sargent. Madame X. 1883-84. Image and data courtesy the Metropolitan Museum of Art. 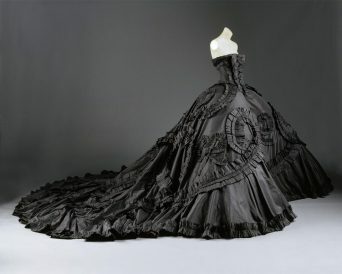 From the house of Dior, John Galliano’s sweeping Maria-Luisa gown (1998) reprises the silhouette à la française, recasting it in black. Slimming back down to the more refined lines of antiquity, the black velvet, dramatically décolleté dress of Madame Gautreau in her 1883-1884 portrait actually crushed her reputation in society. Further, the artist John Singer Sargent was obliged to sell the painting to the Metropolitan Museum years later under the anonymous name of Madame X.
Jacques-Joseph Tissot. Seaside. c. 1878. Image and data courtesy the Cleveland Museum of Art. 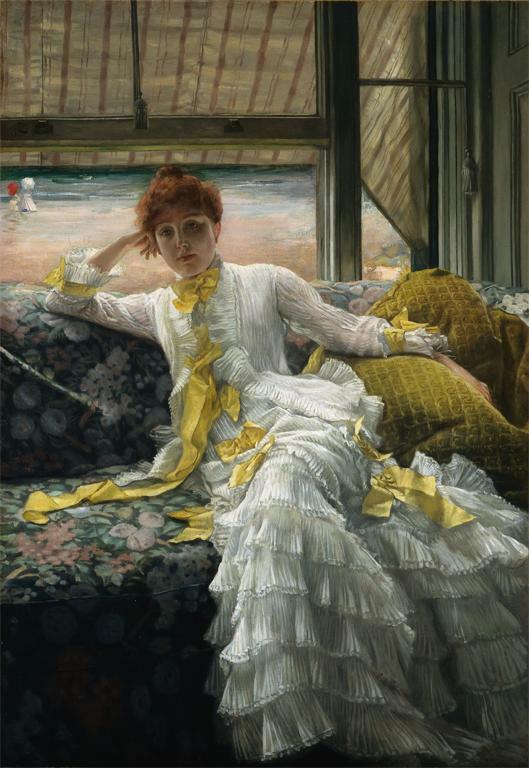 A confection of striped white muslin frills and yellow taffeta bows enshrouds the figure of Kathleen Newton in Seaside (1878) by the painter Jacques-Joseph Tissot, her companion. Tissot’s love of fashion and his genius for painting textiles doubtless originated in his upbringing: his father was a linen draper and his mother a milliner. Aubrey Vincent Beardsley. Aubrey Beardsley’s Illustrations to Salome by Oscar Wilde. 1906-7. Image and data courtesy the Metropolitan Museum of Art. The spiky black cape in Aubrey Beardsley’s illustration for Salomé by Oscar Wilde (1906-1907) provides a foil to Newton’s airy, light gown. Hovering like layers of armor above a serpentine skirt, it enshrines and protects the heroine. 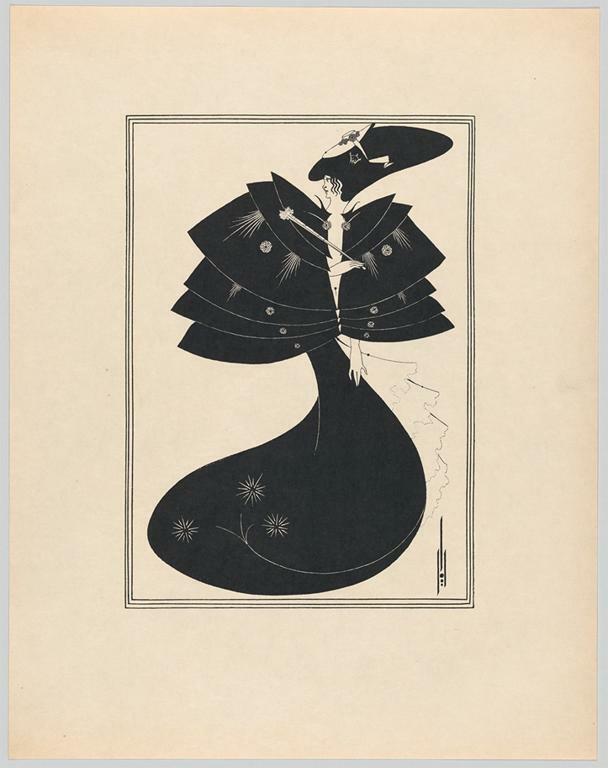 Beardsley brought Japonisme and black-and-whites to the Victorians.